Friendly’s restaurant is notorious for their ice cream. You can’t get any better, especially after a long day in the hot sun, whether you’re at a summer camp or on your way home from work – everyone loves ice cream. It’s the one thing that’s guaranteed to put a smile on your face – unless you’re lactose intolerant, that is. 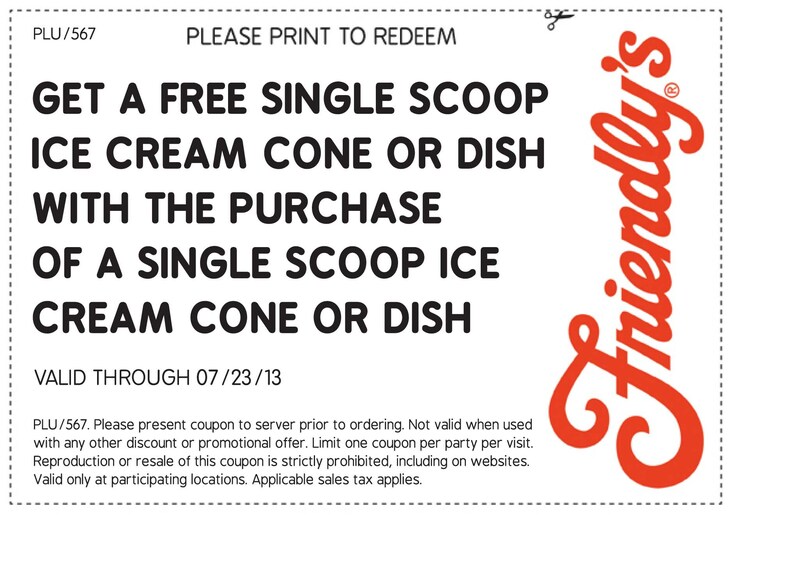 Anyway, you can go and get some cooling off when you use this DISCOUNT ICE CREAM COUPON. 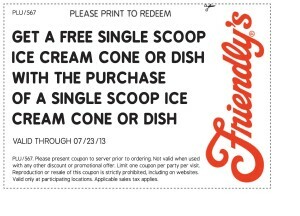 That’s right – Friendly’s just got a little bit friendlier. 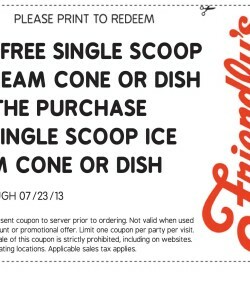 You can get a free single scoop ice cream cone or dish when you purchase one of the same. So that’s like a two for one! Grab a friend and head on down. While you’re there, check out their other menu selections and grab some dinner too. Sit down, relax, unwind, have a few laughs, good food, and top it off with some good ice cream. I’d say that was a perfect way to end the day, wouldn’t you? Tried and true, Friendly’s delivers, time after time. Who wouldn’t want to be in an environment that everyone loves? It’s the perfect place to go and get a bite. Now, if you’re a sports or cheerleader coach, I suggest you round up a couple more coupons for the team, unless you just want to keep this one all to yourself. That’s understandable too! Hot date coming up? Ice cream is a winner, hands down! At any rate, you should give it a lot of thought – but not too much, you don’t want to miss these incredible savings, especially when we’re talking about ice cream. Go check out your local Friendly’s restaurant today. And if you’ve never been there, then welcome to the Friendly’s family!